The AC-1 was a crystal controlled transmitter kit for Novices sold by Ameco in the 50's and 60's. 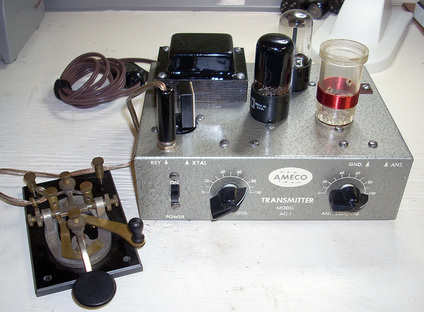 These seem to be very collectible now days but I didn't want it because it's collectible, but because it was the transmitter I dreamed of having as a kid and never got. 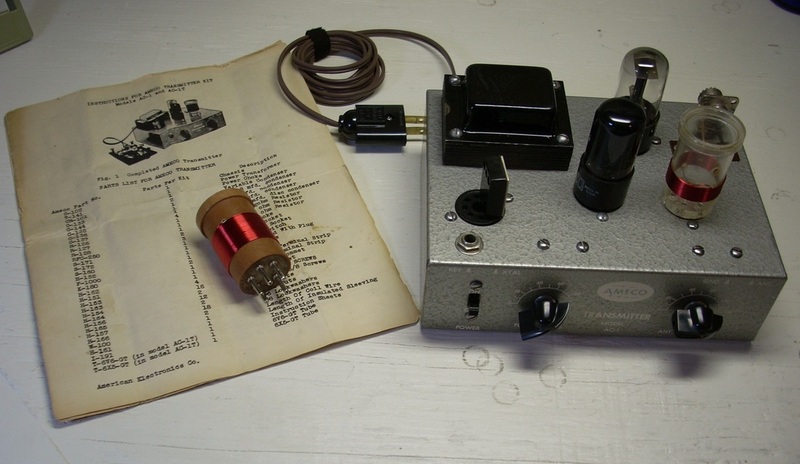 Back around 1970, when I was about 14, I wanted to become a ham and got my hands on a 1968 copy of "How to Become a Radio Amateur" from the ARRL. 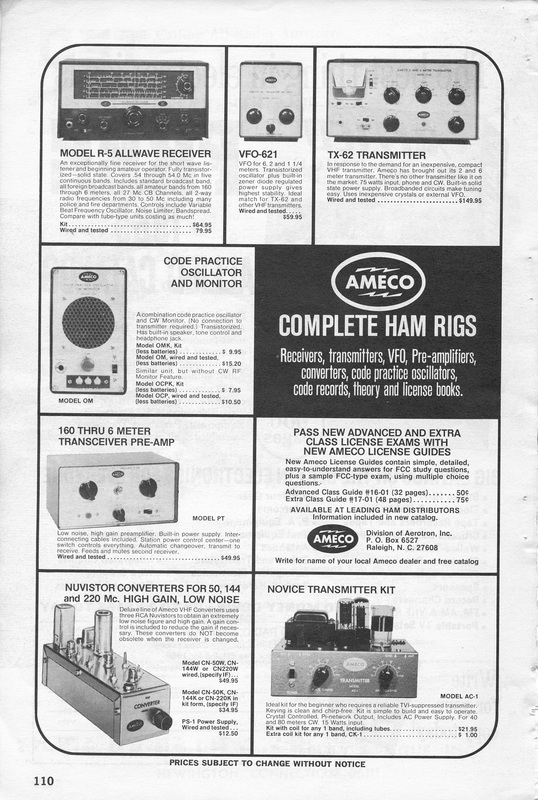 In the back was this full page Ameco ad of their ham equipment including the AC-1. It sold for $21.95 and my mom gave me the money to order it. 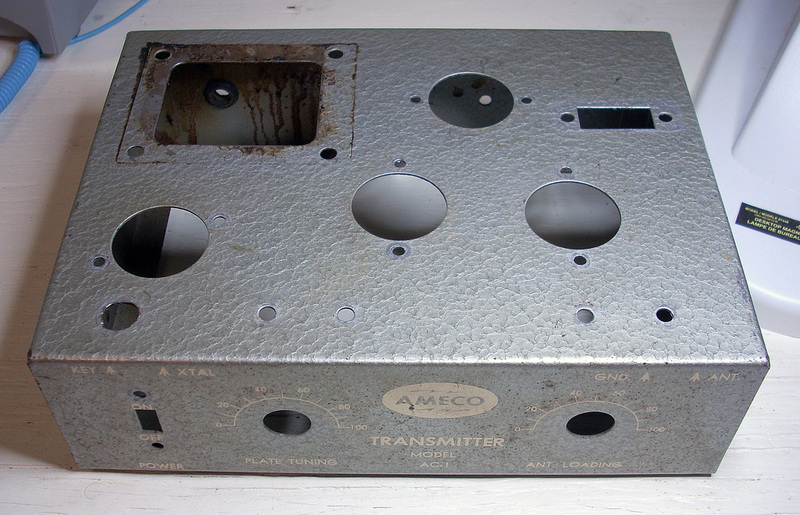 I was really disappointed about a month later when a letter came back from Ameco, with my mom's check enclosed, saying that the AC-1 was no longer available. Top view of the AC-1 as received. 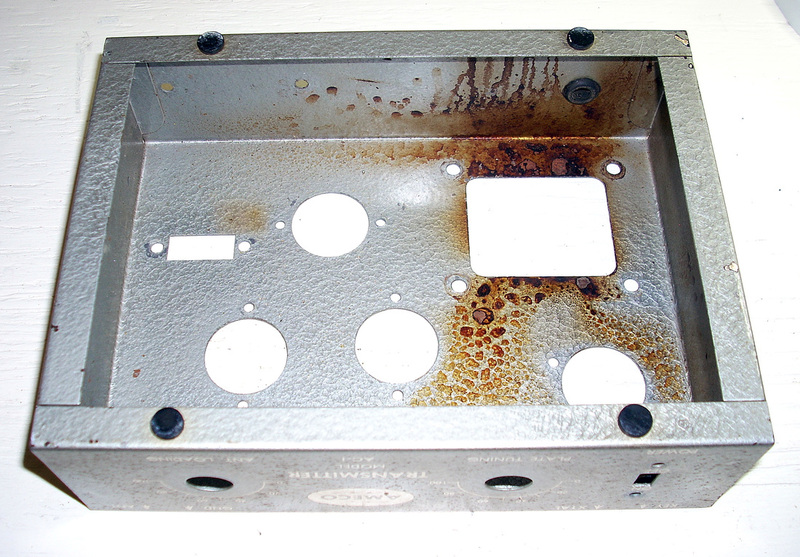 It needs some tender loving care, but only has one non-original hole: someone added a 1/4" phone jack for the key. I can live with the added key jack since it is the kind of mod I might have done myself back then. But whoever added the jack wired it wrong - the jack's center pin was connected to the crystal and not through the RF choke to key the cathode of the 6V6. The underside of the chassis. The original transformer was seriously overheated, to the point of cooking a bit of the paint on the chassis. I wonder how someone managed to do this. The seller included a replacement transformer in place of the bad original. Other issues include the non-original ceramic tube sockets; they will be replaced with the proper cinch-style black sockets. The knobs are also not original and will be replaced with chicken head knobs. Most of the other parts do appear to be original and reusable. All the parts have been stripped from the chassis so it can be cleaned and touched up. A closer look at the burned on mess under the chassis. The top of the chassiis after cleaning. There is a little paint loss to be touched up around the opening for the transformer, but it does not extend beyond the edges of the transformer so it will not be seen once the transformer is mounted. The underside after cleaning. Only a slight stain is still visible around the transformer opening in this picture. Plus there is some paint loss along the rear edge of the opening that needs touched up. I have two options for the power transformer. 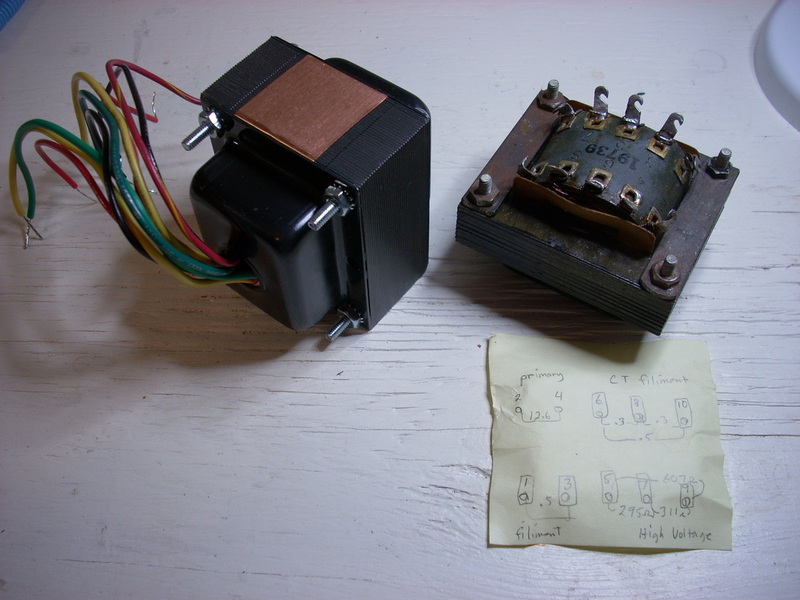 On the left is a new transformer I purchased to build an AC-1 clone. On the right is the non-original one that came with the AC-1 which I will repaint and use if it tests good. 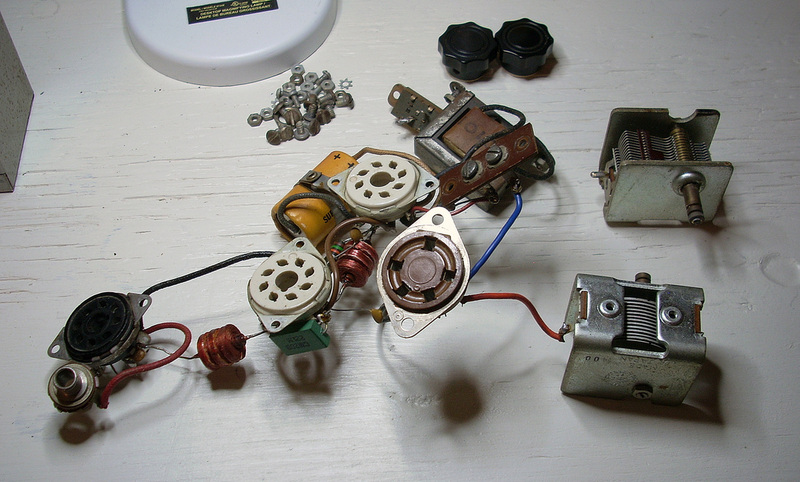 All the components removed from the transmitter chassis. Parts that are original will be reused. 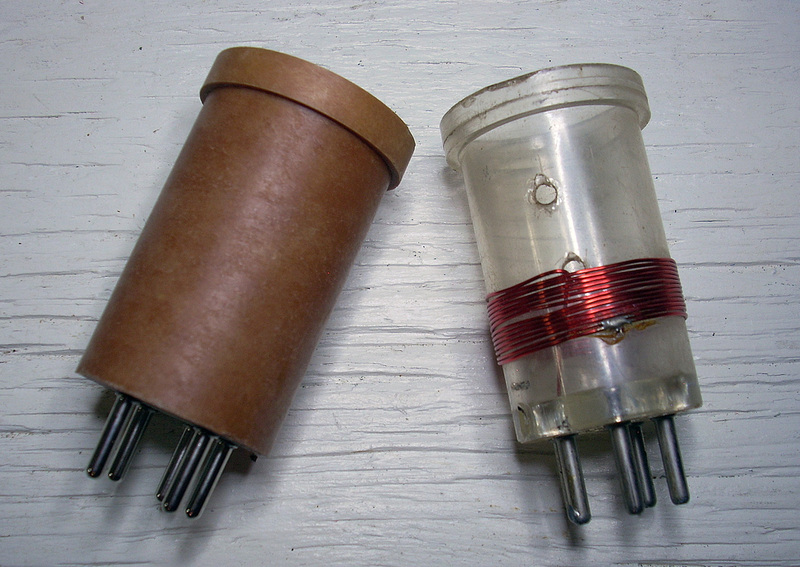 The original coil was apparently wound for 40M but had only 13-1/2 turns of wire (the instructions call for 15-1/2 turns). Plus, someone tried to solder a tap to the coil and soldered the two bottom windings together, shorting them. And then they soldered one end of the coil to the wrong pin of the socket so the coil was not even connected in circuit. Now I'm beginning to understand how they managed to melt down the transformer. Shown on the left is a new phenolic coil form ordered from eBay for winding the 80M coil. 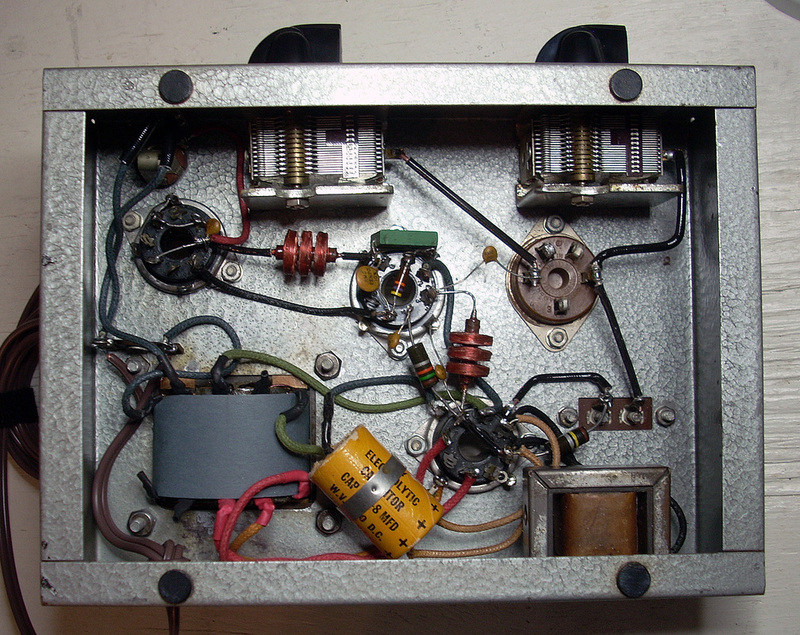 The original dual electrolytic capacitor tested bad on my Heathkit IT-28 capacitor checker so I decided to rebuild the capacitor to keep things looking original. I removed the paper shell and cut open the aluminum can, which was pretty dried up inside (not sure what kind of chemicals might be in there so I used gloves). 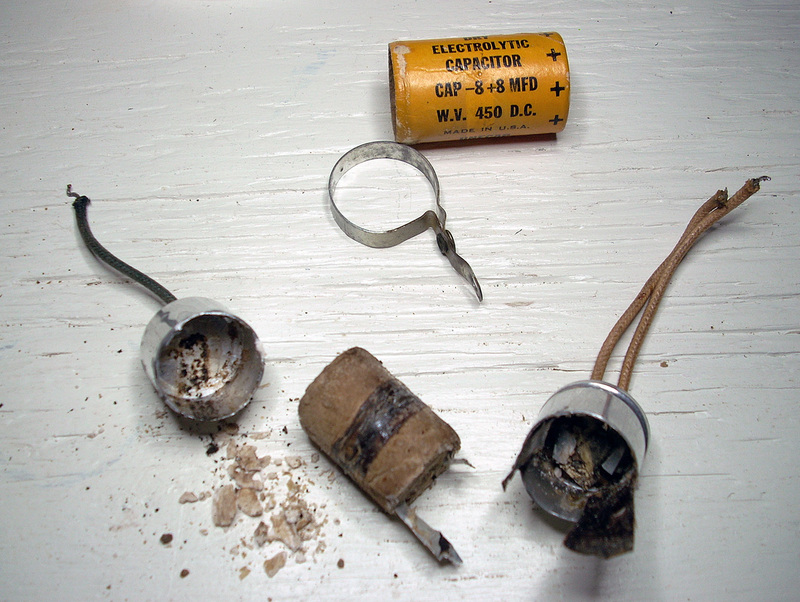 After cleaning the shell I drilled holes through the can's wire connections, for the wires from new capacitors, and then stuffed two 10uf - 450VDC caps inside the old can. From the outside the capacitor still looks original (see photo below). 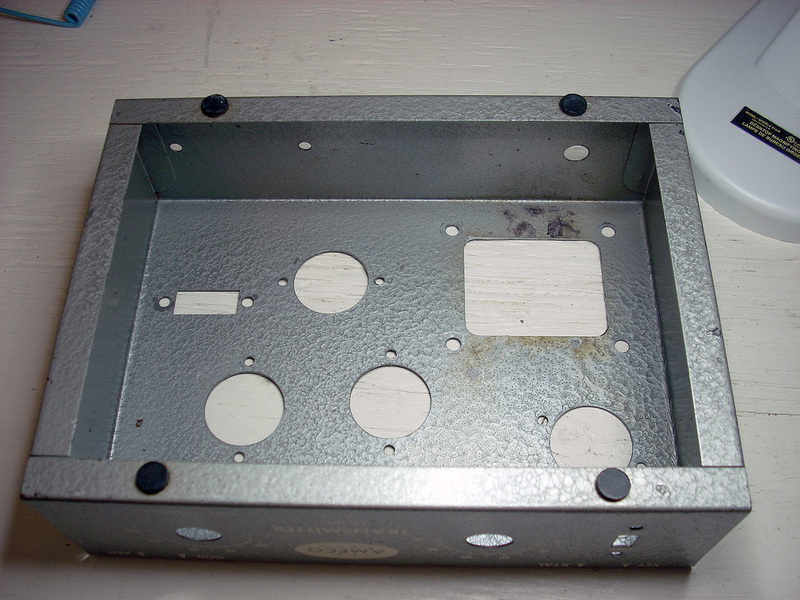 A bottom view of the rewired chassis. 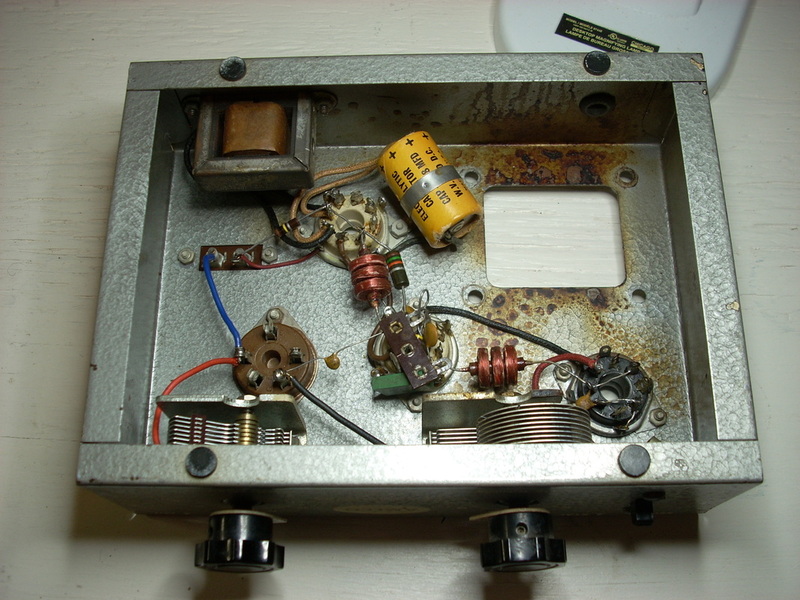 All the parts were reused except the 1/2-watt 100K resistor was replaced with a larger wattage resistor as I've seen in pictures of other AC-1s. 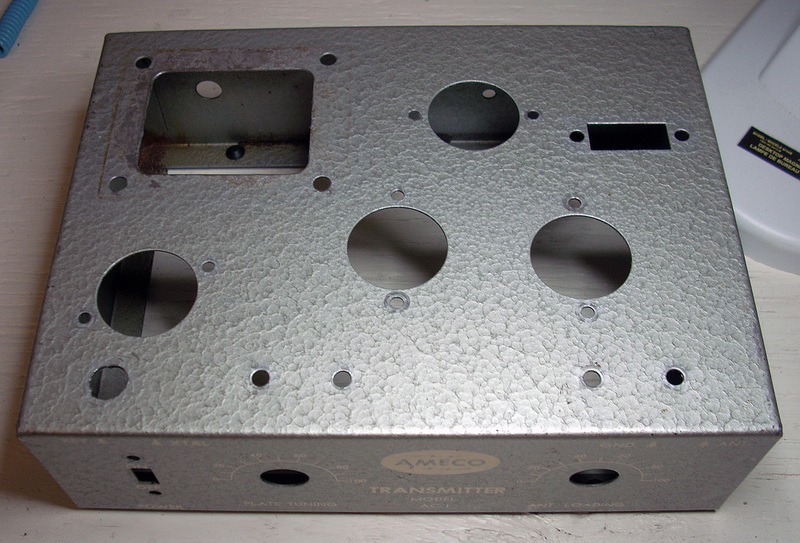 Top view of the rebuilt AC-1 with a J-38 key connected to the 1/4" phone jack. I tuned the transmitter up on my MFJ tuner/dummy load and managed 5-watts on 40-meters from the 6V6 that came with the rig, but got 7 watts out using a new 6V6. I still need to wind the 80M coil and try that. 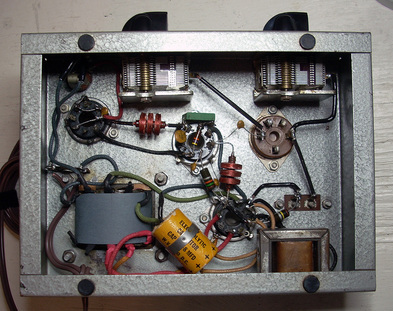 The Rebuilt AC-1 with original instructions and coils for 80 and 40 meters. I added a fused plug to the AC cord to protect the power transformer. The fused plug is very similar to an old Elmenco plug but is actually a new DARE No.1624 plug sold for use with electric fence controllers. 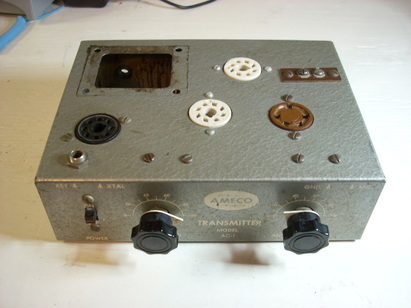 I found a better power transformer for my AC-1 at a local hamfest so I did a quick swap. The old transformer worked OK but had a bit higher B+ and physical looked different under the chassis from the original transformer. This new find is a much closer match to the original and only cost me two dollars.